Resistance to de-wormers is a fact of life, and the situation has worsened greatly in recent years. Surveys indicate that most farms have worms resistant to at least two of the three major groups of de-wormers. Many have resistance to all three groups, and some farms now have resistance to all available de-wormers. But, having worms in your animals that are resistant to de-wormers does not mean that all the worms are resistant. For instance, when all the commonly used de-wormers were first introduced, their efficacy was > 99%. Once efficacy falls below 95%, it indicates that drug resistance is present. At 95% the drug is still very useful, but once drug resistance is present, it usually worsens over time as more and more doses of that drug are given. As the effectiveness of the de-wormer decreases, it provides less and less benefit, and once it falls to < 50%, it is no longer useful as a sole treatment. Given this situation, what is the best approach for using de-wormers? Contrary to popular belief, rotating between de-wormers will not prevent resistance from worsening, and is no longer recommended. Rather, de-wormers should be used together at the same time in combination. How and why do combination treatments work? Research done in New Zealand has convincingly shown that the best approach is to use several different de-wormers all at one time as a combination treatment. In fact, in Australia and New Zealand, there currently are few de-wormer products sold as single drugs; most products contain 3, 4, or 5 different groups of de-wormers (note: other counties have some de-wormers that are not available in the US). By achieving a higher efficacy, there are fewer resistant worms that survive the treatment, thus there is a greater dilution of resistant worms by the susceptible portion of the population (Table 2). 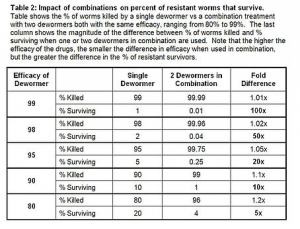 Furthermore, as seen in Table 2, the sooner you start using a combination, the better off you will be, since you see the greatest difference in the percent of resistant survivors when efficacy of de-wormers is high. The more de-wormers that are used in combination, the greater the efficacy of treatment will be. However, if all the de-wormers individually have poor efficacy, the combination will not reach high efficacy. As seen in Table 1, once efficacy falls to 50%, even a combination of 3 de-wormers will still fail to reach a 90% efficacy. As an illustration of why combinations help reduce the development of resistance, but rotation of de-wormers does not, let us look at some numbers. If two drugs each with 90% efficacy are used in rotation, then each time animals are treated 10% of the worms survive (the resistant ones). In contrast, if these same two drugs are used in combination at the same time, then the efficacy increases to 99%. This calculation involves a simple additive function; the first drug kills 90%, and the second drug kills 90% of the remaining 10% [90% + (90% x 10%) = 99%]. Thus the efficacy achieved is now 10X greater and this then yields 10X fewer resistant survivors. Because fewer resistant worms survive at each treatment, there is a greater dilution of the resistant worms among the majority of worms in refugia that are still susceptible. This then will greatly slow the development of drug resistance in the overall worm population. 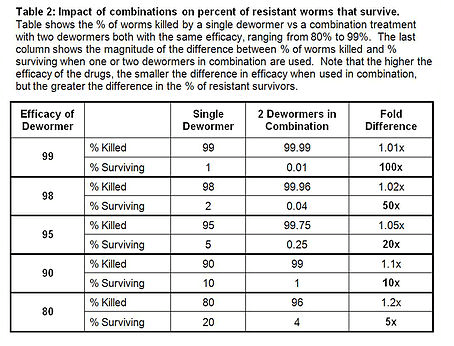 In contrast, if using a rotation of drugs, you would get 10X as many resistant worms surviving each time you treat. Additionally, given the high rates of drug resistance that are known to exist, it is likely that one or more of the de-wormers will have poor efficacy, thus you risk rotating from an effective (or relatively effective) de-wormer to an ineffective de-wormer. By using de-wormers as a combination, you eliminate the risk of rotating to a poorly effective drug, and get an additive benefit that maximizes the effectiveness of each treatment given. But – it gets even better. Dr. Dave Leathwick (AgResearch, New Zealand) published a paper in 2015 in the Journal International Journal for Parasitology: Drugs and Drug Resistance, where seven farms previously diagnosed with resistance to at least two groups of de-wormers were enrolled in a study where each farm implemented a tailored program of “best practice parasite management.” The aim was to ascertain whether the programs, which included the almost exclusive use of combination de-wormers, were able to prevent resistance from developing further. 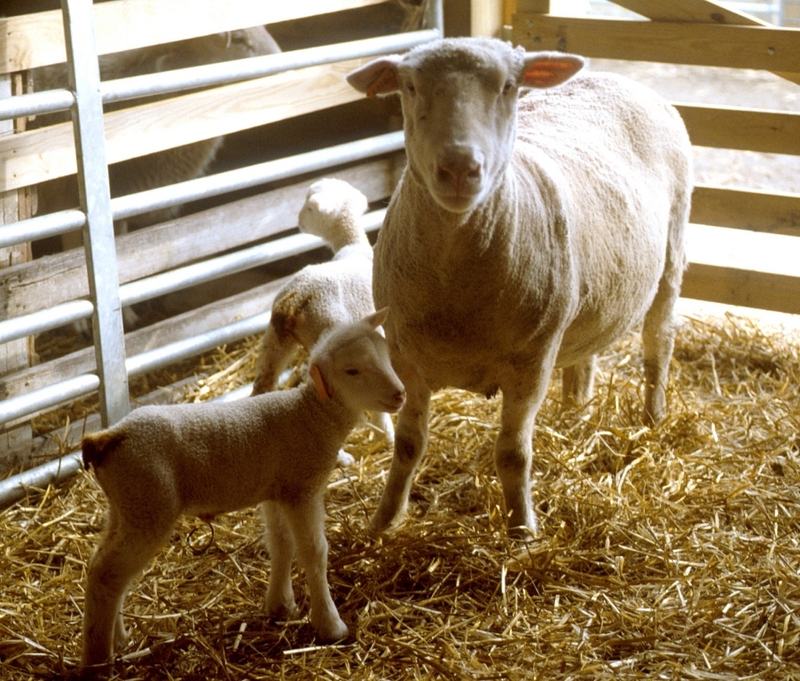 Strategies implemented on each farm varied, but had consistent underlying principles to avoid over-use of de-wormers, manage refugia (and to ensure that only effective anthelmintics were used, by administering them only as a combination). After five years, they demonstrated an overall improvement in the efficacy of the de-wormers (when tested individually), indicating that the use of de-wormers in combination, when applied with other best practices designed to reduce use of de-wormers and maintain refugia, caused a reversion back toward susceptibility. So, there now is very strong evidence that using combination treatment is the best method for using de-wormers and should be instituted on all farms immediately. In New Zealand and Australia, products are sold that contain a combination of de-wormers, so only one product needs to be administered. In contrast, in the USA, no de-wormers are yet sold in this formulation, so the de-wormers need to be bought and administered separately. This increases the cost as compared to the products available in these other countries. Additionally, the different groups of de-wormers are not chemically compatible, thus they cannot be mixed together in the same syringe. Rather, they need to be administered separately, but can be given one immediately after the other. All de-wormers should be administered at the full recommended dose whether administered singly or in combination. If using de-wormers in combination, it is critical to maintain refugia; thus, one should be using a selective treatment approach based on FAMACHA© (see FAMACHA© section of the ACSRPC website for more information on this method and for further explanations of refugia). The presence of refugia is essential to realize the full benefits from combinations. In fact, if refugia are not maintained then you will not get the necessary dilution of the resistant survivors, and this will then lead to having multiple-resistant worms that can no longer be controlled with the combination treatment. 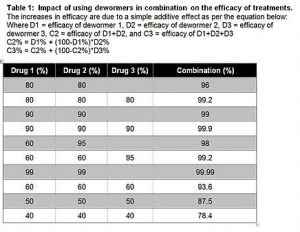 If the efficacy of your de-wormers are > 80%, it is possible you may not notice any difference in the clinical response of treatments when applied singly vs. in combination. However, the impact on the further development of resistance could be quite large (Table 2). Any safety precautions that exist for a single de-wormer will also exist when used in a combination; however, there are no known additional risks with using more than one de-wormer at the same time. Posted by Braden Campbell at 8:00am April 16, 2019 Posted in Parasites and tagged Management, Parasites. Bookmark the permalink.